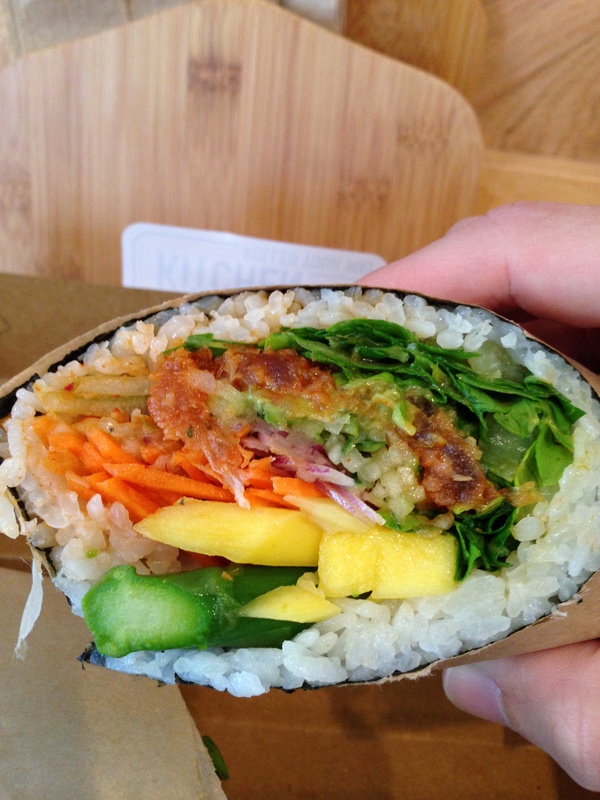 t says: When it first debuted, Hai street was reported as peddling “Japanese Burritos”. It kind of turned me off. Does that mean that ssam are “Korean burritos”? Does that mean that Samosas are Indian empanadas? Or maybe these are all just wannabe ravioli? In any case, the idea of Japanese burrito, in my mind, involves a flour tortilla – kinda how like when Korean tacos were a craze (?anyone remember that? ), it was korean shortrib and rice in a tortilla. But lo and behold, there is no tortilla anywhere at Hai street Rather, it seems that the product in question is basically ginormous maki. 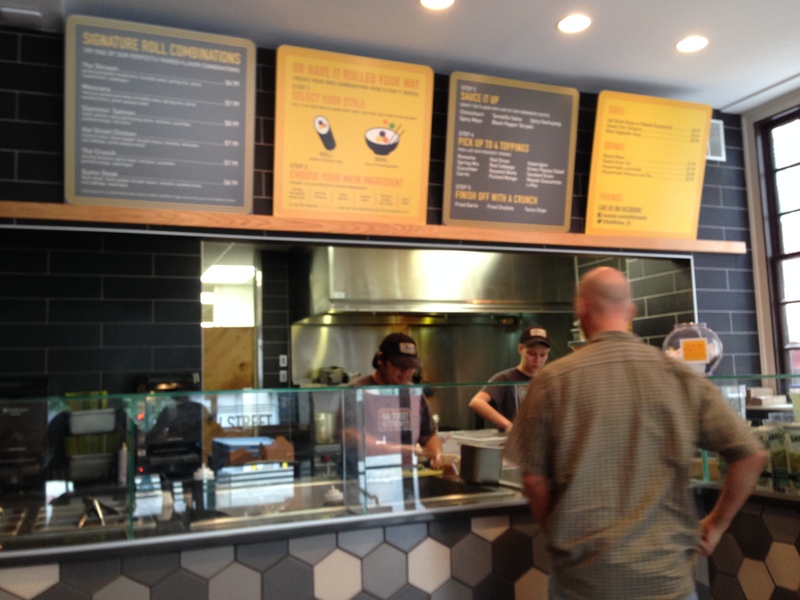 But, to keep the “Japanese Burrito” theme alive, I’m going to compare Hai Street to Chipotle … because … you know … why not propagate a fallacious simile? August 2014, Thursday Lunch, Party of 2. The setup is very chipotle-esque. You see a menu behind that gives a rough idea of your “burrito” contents and then you can select the fresh ingredients in front of you. I tried to get as up-close-and-personal as possible. So now some people might be upset with Hai Street because the star filling that you selected isn’t very plentiful – it’s not like the enormous portion of meat you’d get in a Chipotle Burrito, rather, in equal proportion to the various ingredients that’s added. To be honest, I kind of like this way better! And the reason is because it comes off more like a maki this way. No one should complain of a maki having too little of the protein – makis are supposed to have a balance of ingredients in their innards. And here, with the plethora of other interestingly flavored items (e.g. garlic chips) and interestingly textured items (e.g. mango), it really was like eating a lovely salad and a splash of seaweed and rice. OH – and the rice wasn’t bad! That was what I as expecting would have been the biggest problem: bad rice. But I guess if someone is going to be a sous for Morimoto, they better know how to make consistently decent sushi rice (I mean, it wasn’t blow-me-away rice, but it was good!). 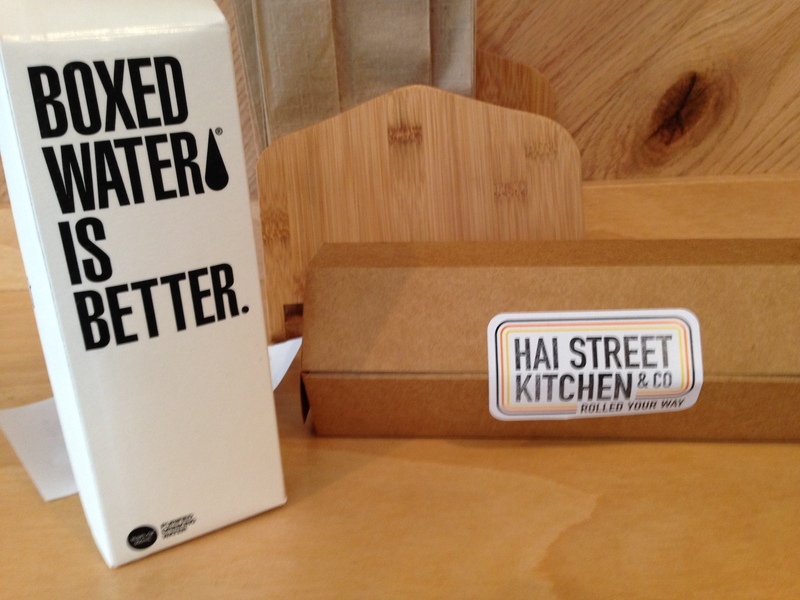 Is Hai street the end-all-be-all of Japanese cuisine? No. Is it going to replace Chipotle? No (but man, we’d be a helluvalot healthier if it did). Will I go there again – you bet!